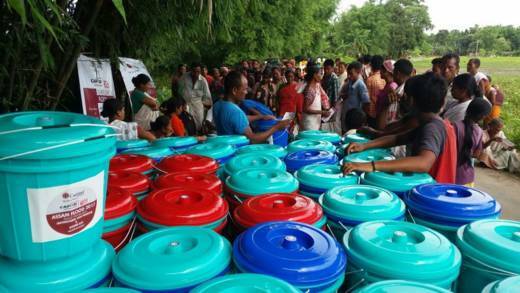 Caritas India responding to the 2017 floods in Assam, India by distributing hygiene kits to communities affected by the flooding and training people in safe and appropriate water and sanitation practices. The unrelenting rain which began in July and spiked in early August has caused unprecedented flooding and landslides across the Southwestern state of Kerala, India. 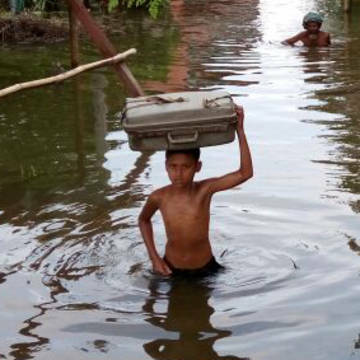 In the worst floods in a century, torrential rainfall has left over 300 dead and hundreds of thousands homeless, with many still stranded, running out of clean water and food. The Indian military launched rescue efforts to reach those communities who had been cut off for several days and helped to rescue over 20,000 people. Now, receding flood waters are giving hope to the hundreds of thousands who are now homeless, but many families who have lost everything now need emergency aid and to be protected against disease outbreaks in relief camps. Wider Caritas response across the Kerala region. Following the Kerala floods, CAFOD, alongside local organisation Caritas India, were able to provide a rapid response to the floods in Kerala. Emergency kits – which included water, food, clothing items, bedsheets and blankets, and utensils (8250 NFI and 6124 Food Kits distributed) - for over 20,000 members of the communities immediately effected by the crisis. Distributed 12,874 hygiene kits, for women and girls across 14 affected villages. Training for over 10,000 people on sanitation and hygiene practices to prevent the spread of disease. Our experienced local aid workers on the ground were also able to provide temporary shelter, and support to families to re-start earning a living through a small cash transfer scheme, enabling them to buy seeds and livestock. Ratnamma with her slow cooker, provided by Caritas India, following the Kerala floods. Ratnamma was one of the thousands of people to benefit from Caritas India’s assistance. After she was affected by the floods and her cooking equipment destroyed, she could no longer make meals for her family. Returning to a routine after a disaster – including being able to eat meals as a family - is a very important factor to help return life to normality. Caritas were able to provide a pressure cooker so Ratnamma could begin to start providing for her family again. In August 2018, Nabeeza's house began to flood when heavy rainfall caused widespread flooding across Kerala state, India. Her house became cut off from the rest of the village and she had no choice but to evacuate with nothing more than the clothes on her back. Mother, Nabeeza lives with her son, daughter-in-law, her daughter and two grandchildren. Last August, when the flood waters began to rise, her house became cut off from the rest of the village. She had no choice but to evacuate with nothing more than the clothes on her back. After the water receded, Nabeeza returned to an empty house – all her possessions had been destroyed. Her son, a daily wage worker, was unable to go to work due to the damage the floods had caused. And, alongside taking care of the daily household chores, she was now also caring for her pregnant daughter. With the support of Caritas India, the family received clothing, bedsheets, mosquito nets, water buckets, and hygiene items. “I am happy that Caritas India has helped me regain a part of life,” she said. What will be the longer-term needs of the community? Over the next few months, it is important to help communities not only rebuild their homes but to work alongside communities to re-establish local economies. “Farmers, daily wage workers and agricultural labourers won't earn anything for the next two to three months. Thousands have no homes to go back to. Why is there severe flooding in India? Although August is typically monsoon season in the region, the incessant rainfall has led to the worst flooding seen in the region in a century. It is widely accepted that climate change brings an increased risk of floods and could have a role to play in the severity of the monsoon rains. CAFOD and the Caritas network are providing emergency relief to affected communities.